The UK girlbands are all coming out of the woodwork and once again I find myself going, wow - they are pretty good. Looks like Red Blooded Women might have some good company in the way of City Girls. They got a fresh sound. The song sounds a bit like it samples a part of Rihanna's "Umbrella". Great Pop Tune!!!!!!!!!!!!!! What Do You Think About This New Group? So, while the ebullient ‘Girls’ gets right in-your-face with the new Sugababes agenda - ‘All independent women know/It takes a lot to run the show/I am the fire and the coal/I am a woman in control’ speaks for itself, wouldn’t you say? - other highlights from their most artful, sophisticated and eclectic collection so far provide the more subtle dimensions. Robyn producer Klass Ahlund brings that Swedish genius for high concept-pop to the table with the self-referential reinvention of vintage Motown of the bittersweet ‘You On A Good Day‘, and the extraordinary, darkly comic Abba-meets-street-beats drama that is ‘Murder One‘, where Heidi relishes the opportunity to play the ultimate Black Widow. Amelle takes an edgy lead on Klaus’s superbly creepy, G-funk-tinged ‘Beware’ and the tear-stained minimalism of ‘We Can Call A Truce‘. The ‘Babes and Duffy collaborator Steve Booker were always going to be a perfect fit: ‘Sunday Rain’ is a torchy orchestral epic, full of melodrama and agony, and ‘Sound Of Goodbye’ sees Keisha and Booker making sweet music together. ‘Denial’ producers Invisible Men take the girls to the feminist funk high ground with the delicious ‘No Can Do‘, built on the tough and tender riff from rare groove masterpiece ‘Yes, Its You’ by Sweet Charles. And Hanging On A Star? Pure girl-group disco magic. All prove that The Sugababes have taken yet another giant leap forward. Because the girls are well aware that, unlike their pure pop peers, the Sugababes mean something to people. Push The Button, Freak Like Me, Overload… these were era-defining records that transcended the boring stuff about units shifted and celebrity recognition and defined big moments in our lives. The new record is about bringing all those definitive Sugababes moments back, making them brand new, and cramming them all into one classic album. Commercial success isn’t enough for Keisha, Heidi and Amelle… they want people who live and breathe music to be blown away by them again. Six albums is unheard of unless you’re a rock act. The new tracks explain why Sugababes have such staying power, and why you’ll be gagging to hear albums seven and eight. 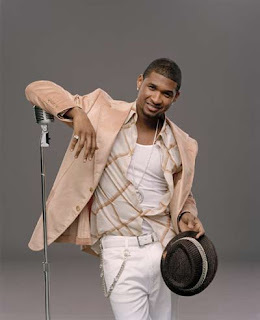 Here is a new leaked track by the "Yeah" singer Usher. The song samples an older song. I have to say that i totally adore this track. It has a sick beat and Usher shows very good vocals. The track was produced by the Clutch (Ciara, Omarion) and Danja (Britney Spears, Missy Elliot). Amazing tune!!!! Todays song of the week is the amazing pop tune "Up" by the Saturdays. Very catchy...here are some infos about them. The Saturdays are a five-piece British girl group. The band consists of former S Club 8 members Frankie Sandford and Rochelle Wiseman as well as Mollie King (who was once in a girl band featured in The X Factor, Una Healy and Vanessa White. The group are signed to Fascination Records, a division of Polydor, and were first seen supporting Girls Aloud on their Tangled Up Tour in 2008. Their début single, "If This Is Love", was released in shops on 28th July 2008 and reached number 8 in the Official UK Top 40 on August 3rd, 2008. I think this is my fave comeback this year so far. Pink shows her greatness with her single "So What" and the video is on the same level. Very funny video and she looks also at her bests. Also her ex will be shown in the video. AMMMAAAAAAZZZZIIIINNNNGGGGGG!!!!!!!!!!!!!!!!!! Here is the new video for Cassie's new single "Official Girl" the video version features rapper Lil Wayne. I don't like his part, cause he give nothing special to the song. The video looks very great and Cassie is such a beautiful girl. With the video i like the song alot more, but i think she needs a stronger song to show her skills. Also another album i want to give you a preview to is the great work "The Fame" by Lady Gaga. The first track is named "Poker Face" and it's a faster song with great pop/electro beats. I so adore this music style. Next track is called "Paparazzi" and it's a bit slower. The chorus is very catchy and it's a great standout-track from this album. Amazing fusion of pop and electro. Last track is named "Beautiful Dirty Rich" and it's also a catchy song. I really like the verses. Lady Gaga shows a really great and creative debut album. I will get a copy of this record!!!!! What Do You Think About The Songs?